The DuSable Museum of African American History will celebrate the 20th Anniversary of one of Chicago’s most popular social events, the “A Night Of 100 Stars” Gala, Saturday, March 28. This black-tie event, which is known for its lavish food and drink buffets, world-class entertainment, and impressive awards presentation, will take place from 6 PM until the stroke of Midnight, at the South Shore Cultural Center, located at 7059 South Shore Drive in Chicago. Once again proceeds from “the party with a purpose,” will benefit the Museum’s educational programs and exhibition schedule. During the event, for the past twenty years, dozens of individuals have received the DuSable Museum History Makers Award. These highly coveted awards honor African American Chicagoans (current or former) who have made outstanding contributions to society through their careers and civic engagement. Educators, medical professionals, performers, politicians, actors, business leaders, members of the clergy, and civil rights leaders make up the stellar group of those who have been honored. Among this elite group are: Reverend Jesse L. Jackson (1999), Grammy Award-winner Mavis Staples (2003), the Governor of Massachusetts, Deval L. Patrick (2012), fashion model and television personality Janet Langhart Cohen (2006), radio icon Tom Joyner (2011), basketball legend Michael Jordan ( 2000), award-winning author Lerone Bennett, Jr. (2003), and poet Gwendolyn Brooks (2001), just to name a few. Dr. Massey is currently the President of the School of The Art Institute of Chicago, a post he assumed in the fall of 2010. He is also the President Emeritus of Morehouse College in Atlanta, Georgia, having served as President there from 1995 to 2007. Immediately prior to that post, Dr. Massey was Provost and Senior Vice President for Academic Affairs of the University of California system. In that role he oversaw three national Department of Energy laboratories. Additional credentials include serving as Professor of Physics and Dean of the College at Brown University, a Professorship at the University of Chicago and serving as faculty at the University of Illinois at Urbana-Champaign. President Preckwinkle has been a dedicated community leader for over two decades and before being elected to her current position, she served 19 years as Alderman of the 4th Ward of the City of Chicago. During her tenure she successfully fought for greater funding for education and affordable housing in her Ward, in addition to sponsoring the Living Wage and Affordable Housing Ordinances. Her independent and progressive leadership earned her the IVO-IPO “Best Alderman Award” six times. Ian Smith is the author of the #1 New York Times best-selling books, SHRED: THE REVOLUTIONARY DIET and SUPER SHRED: The Big Results Diet. He is the former co-host of the Emmy award-winning daytime talk show, The Doctors, and has served as the medical/diet expert for six seasons on VH1’s highly-rated Celebrity Fit Club. Dr. Smith is the host of his own nationally syndicated radio show “Health Watch” and has appeared extensively on numerous television and radio broadcasts. He was recently appointed by President Barack Obama to a second term on the President’s Council on Fitness, Sports and Nutrition. Salli is an industry veteran of over thirty years who has been featured in more than 25 major films and countless television programs. She has co-starred with some of the most powerful leading actors in Hollywood: Denzel Washington in Antwone Fisher; Samuel L. Jackson in The Great White Hype, Mario Van Peebles in Posse, and Will Smith in I Am Legend. She has further cemented her own “legend” with a featured arc in Aaron Sorkin’s HBO hit, The Newsroom and currently can be seen appearing on the hit show Being Mary Jane opposite Gabrielle Union. Ms. Whitfield has even lent her sultry voice to the cult classic cartoon Gargoyles. In addition, she is currently starring in and producing A Lady Must Live, a biographical play on the life of the legendary entertainer Lena Horne. Maria C. Green, Senior Vice President, General Counsel & Secretary, Illinois Tool Works, Inc., and Thurman “Tony” Smith, Senior Vice President, Community Development Banking - Market Manager, PNC Bank. Tickets for the “A Night of 100 Stars: 20th Anniversary Gala” are $400.00 per person and available at the DuSable Museum of African American History and/or thedusablemuseum.eventbrite.com. 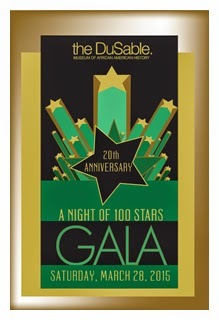 More details regarding the “A Night of 100 Stars: 20th Anniversary Gala” will be announced in the coming weeks. For additional information on this event please visit www.dusablemuseum.org, or telephone 773-947-0600. Chicago’s most popular social events, the “A Night Of 100 Stars” Gala, Saturday, March 28. This black-tie event, which is known for its lavish food and drink buffets, world-class entertainment, and impressive awards presentation, will take place from 6:00 PM until the stroke of Midnight, at the South Shore Cultural Center, located at 7059 South Shore Drive in Chicago. Once again proceeds from “the party with a purpose,” will benefit the Museum’s educational programs and exhibition schedule.